Club Honours: (with Glentoran) Irish League Champion 1912/13, 1920/21; Irish Cup Winner 1913/14, 1916/17, Runner-Up 1912/13, 1915/16, 1918/19; Gold Cup Winner; City Cup Winner; Co. Antrim Shield Winner; Vienna Cup Winner 1913/14. Davy Lyner made his name with Glentoran in the immediate pre-Great War seasons, taking the place of his elder brother, Roly, who had left for Linfield. He was still a teenager as he won Inter-League honours and the Irish League title at the end of 1912; and by the end of that season he played in the Irish Cup Final defeat by Linfield. The 1913/14 season brought Lyner an Irish Cup winner’s medal – with Glentoran defeating Linfield 3-1 in the final for their first ever win – and also successes in the City Cup and Vienna Cup. The Vienna Cup is much vaunted by Glentoran as “the first ever European trophy won by a British club.” Whilst this statement is not strictly true, winning the trophy was an impressive achievement with a Vienna Select defeated 5-0 in the deciding match. 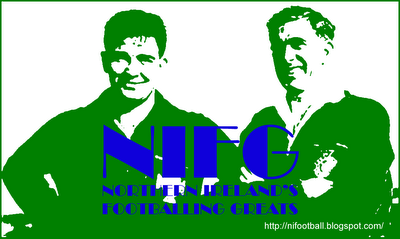 Lyner remained a regular for Glentoran throughout the War-years, claiming further Irish League and Cup medals. As football returned to normal he was awarded a first ‘cap’ by the Irish FA, playing in a 2-1 Victory International defeat to Scotland (who incidentally played the first twenty minutes with only nine men due to late arrivals). Full caps weren’t far behind, Lyner playing on the left-wing in a 1-1 draw with England at Windsor Park in October 1919, and on the right in a 2-2 draw against Wales four months later. 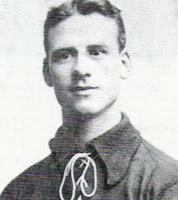 Transferred to Second Division Manchester United in August 1922, Lyner made his Football League debut in a 2-1 defeat at Coventry City on 23 September. That proved to be one of just three first team appearances during Lyner’s time at Old Trafford, and come Ireland’s October 2-0 defeat by England at West Bromwich, he was a regular feature in United’s Reserves. In December 1922, just four months after arriving at Manchester United, Lyner was transferred to Kilmarnock. It was during his time at Kilmarnock, a club constantly towards the foot of the Scottish First Division, that Lyner won his sixth and final cap, finally tasting victory, 3-0 over Wales. After two seasons as a regular at Rugby Park, and then aged 32, Lyner returned to Ireland to play for reigning League champions, Queen’s Island. He took his total of clubs during the 1924/25 season to four with brief spells at Dundela and back in Scotland with Clydebank. In the 1925/26 season he moved to Wales, signing with Mid-Rhondda, and in 1926/27 he was back in the Football League with New Brighton. In 1927/28 Lyner returned to Glentoran for what proved to be a disappointing season, though he did join the select few who have played more than 300 games for the club. He then ended his senior playing career back at Queen’s Island, who finished bottom of the Irish League and failed to gain re-election in 1929. Summary: 6/0. Won: 1, Drew 3, Lost 2.